Pain is inevitable. Whatever field or career you choose, you’ll still feel pain, not unless you’re numb, or you’re a mutant. Haha. Kidding aside, I know most of us felt pain at some point, be it physical, emotional, mental, etc. 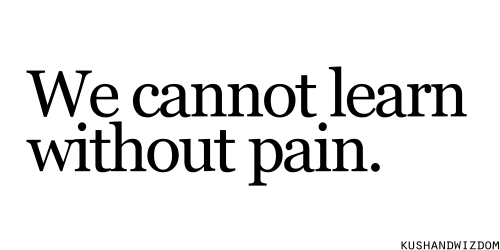 Sad thing is, we have to feel pain over and over again so that we can learn from it. Learning without sacrifice is not learning at all. At some point, you have to sacrifice a small portion of your self so that you can learn. You have to exert an effort to equip your self with the knowledge that you have to know, and you have to be smart so you can survive this enormous jungle we usually call as “life”. Academic year 2012-2013 just ended, and that means SUMMER IS HERE! 🙂 But then, the summer heat is sucking away all the energy in me. Haha. Anyhow, I was (again) MIA for 5 months because of school. I need to focus more on a lot of academic stuff. So, yeah. Haha. I live in the Philippines. I have seen, witnessed, and even experienced some natural calamities and disasters that happened here in our country. I thought, all the while, that I have experienced the worst when it comes to typhoons because we used to live in a low-lying area, and floods are quite “normal” to us every time there is a storm or typhoon. But now, my whole perspective changed when I saw some clippings and video footages of how Typhoon Haiyan, or as we locally call it “Typhoon Yolanda”, literally destroyed some parts of our country. I can’t put into words all of my emotions whenever I watch news programs. Honestly, I can’t stand watching the news anymore. My heart breaks whenever I see the current situation in the provinces of Samar, Leyte, and Bohol. Now, I am asking for your help. Yes, all of you. If you have few extra clothes, toiletries, hygiene materials, canned goods, bottled water, etc., please donate it for the typhoon victims. In my case, I donated some of my clothes and some of my savings. This is best time to share and take an active participation in our community. Again, I humbly ask for some of your “treasures”. My fellow countrymen needs it.